Posted on September 3, 2015 by thelostlighthouse	in Comics, Literature and tagged comics, comics reviews, Emi Lenox, Image comics, Image Expo, Jeff Lemire, Jordie Bellaire, Literature, Mystery, Plutona, Sci-Fi, superheroes, The Lost Lighthouse, TLL. This week I picked up Plutona #1, one of a large group of new creator-owned Image books I’ve been looking forward to for a while now, ever since being announced back at the Image Expo in January. Plutona is a five-part mini series created by Emi Lenox and Jeff Lemire, with Lemire on scripting duties and art by Lenox, colours by Jordie Bellaire and letters from Steve Wands. Plutona takes place in a world filled with superheroes, but follows the lives of five school kids, most of whom seem to show little interest in the fantastical world they live in, other than Teddy the ‘capespotter’. Along with Mie and her little brother Mike, Diane and Ray, Teddy goes through his normal school day. After school, Ray sees Teddy staring out at the city with his binoculars, and teases him for being a pervert. By the time the others walk past and join them however, Ray has to pretend he was still making fun rather than excited to be looking out for C.O.M.Bat and the other heroes. Mike disappears into the nearby woods, so Mie leads the others all off to find him. His cry brings them all to him, as the issue closes with the five kids standing around the dead body of Plutona, the reclusive superhero. This first issue wastes no time in introducing the cast of characters at breakneck speed as they prepare for their day at school, all fulfilling various out-group high school roles while not feeling like two dimensional cut outs. I was expecting more on the heroes themselves, but Lemire subverts this deftly and instead quickly builds a grounded story with the super-heroics as a backdrop that makes the world feel more lived in. As I approached the end of the story, I felt that not showing the heroes (Plutona in particular) in action at all may end up being a misstep, but I found this itch scratched by a mini backup of sorts by Lemire shown in the form of a mock up issue of an in-universe Plutona comic titled ‘Plutona’s last adventure!’, showing her balancing her dual identities and lives while teasing at the mystery of how she ended up dead in a forest, alone. Lenox’s art is gorgeous, immediately calling to mind a Scott Pilgrim aesthetic, but while it was less overly cartoonish and realistic, there is a wide-eyed charm to the characters that feels very natural. The bright enthusiasm of the bulk of the book is framed and overshadowed by the chilling opening pages and dark run through the forest at the end, and the wonderful art is brilliantly realised through Bellaire’s colours that suits the tone brilliantly. 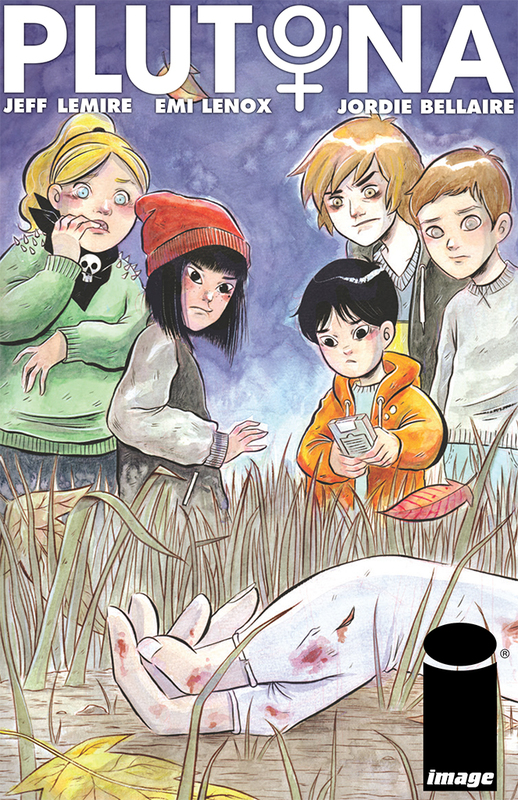 Plutona is off to a very strong start, turning the superhero genre on its head to tell an intriguing mystery about the death of a hero, and how these children will deal with being the ones who find the body. Pick this up at your local comic shop or digitally today.